Looking for a bus in Naperville? Chicago Charter Bus Company has access to hundreds of buses to take you the Riverwalk, the Dupage Children's Museum, and more. As a suburb of Chicago, living in Naperville means you often get the best of both worlds. You get the relaxation of suburb life and the fun of city life at any moment you wish. Not to mention, the “suburb life” in Naperville is pretty great—attractions such as the Naperville Riverwalk and Centennial Beach make the location a destination of its own. But there’s no doubting that most bigger events—weddings, concerts, and conventions—often happen outside of your town and in the big city. 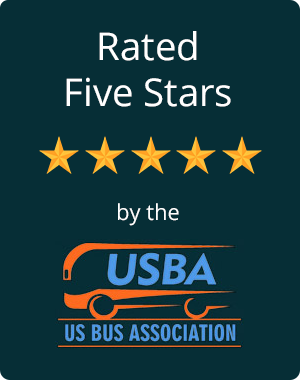 Whether you need transportation from Naperville into Chicago or somewhere farther, such as Milwaukee or Indianapolis, you can count on Chicago Charter Bus Company to have you covered. No matter your need for group transportation in or near Naperville, Illinois, certainly we have access to the perfect bus for your group. With the ability to customize each ride based on passenger preference, you can treat riders to a one-of-a-kind experience. Be sure to ask more about the upgrades you can add to your vehicle when you are speaking with your booking specialist. The options are seemingly endless when it comes to the types bus rentals we can facilitate. Perhaps you need an airport shuttle to pick up the C-Suite when they fly into O’Hare International Airport. Maybe you want to rent a 25-passenger minibus to bus your bachelorette party to Lynfred Winery. Or you could be a school official hoping to find spacious charter buses for upcoming class field trips and sports tournaments. We happily work with a variety of clients and all of these occasions are well within our wheelhouse! View all bus sizes available and check our services page for more information on how we can help Naperville residents rent top-notch group transportation. Need transportation in another Chicago neighborhood? Chicago Charter Bus Company also services Arlington Heights, Elgin, Evanston, Northbrook, and more, making it easy to schedule reliable group transportation around the city. We don’t like it when people pressure us, so we won’t pressure you. When you receive an affordable bus rental quote from Chicago Charter Bus Company, you will have no obligation to book. Our priority is this: hearing your private bus rental needs, finding you a solution, and delivering an accurate quote within minutes. That’s it. We won’t push you to book immediately, though you can if you want—it’s really that simple. Call us at 312-667-0906​ whenever you’re ready. We’re here 24/7 to answer all your questions about booking a shuttle or bus in Naperville, Illinois.